IR’s Anastasia Diakos holds her ground while trying to get a pass off during IR’s win over Sussex Central last week. Caesar Rodney’s Jessie Prillaman got behind the IR defense just over three minutes into overtime and slipped a shot past goalie Hanna Bird to give the Riders a 3-2 win on Tuesday, April 9. According to the IR website, it was the 15th straight time CR has beaten the Indians dating back to 2009. The Riders had jumped out to a 2-0 lead in the first half when Laynee Ford and Jada McCullough each picked up goals. Prillaman and Ford, respectively, assisted on the CR scores. IR’s Izzy Binko cut the lead in half when she took a pass from Tobi LoRusso in the 36th minute and slipped it passed the Riders’ Morgan Desaulniers. It would remain that way until late in the second half, when IR would convert a corner-kick opportunity, with Sia Diakos burying an initial rebounded shot past Desaulniers to tie the score at 2-2. In the overtime, IR dominated ball control from the midfield but just couldn’t find a way to convert offensively. Then Prillaman was able to slip through the defense for the game-winner in the 85th minute to end it. The IR players “can see how close they were to getting the win,” Kilby added. “They played like they wanted it. We controlled the overtime, with the exception of that one ball left long. They deserved better. They wanted this game in the worst way. IR held a 17-13 advantage in shots, and a 4-3 edge in corner chances. Bird finished the game with seven saves in goal. 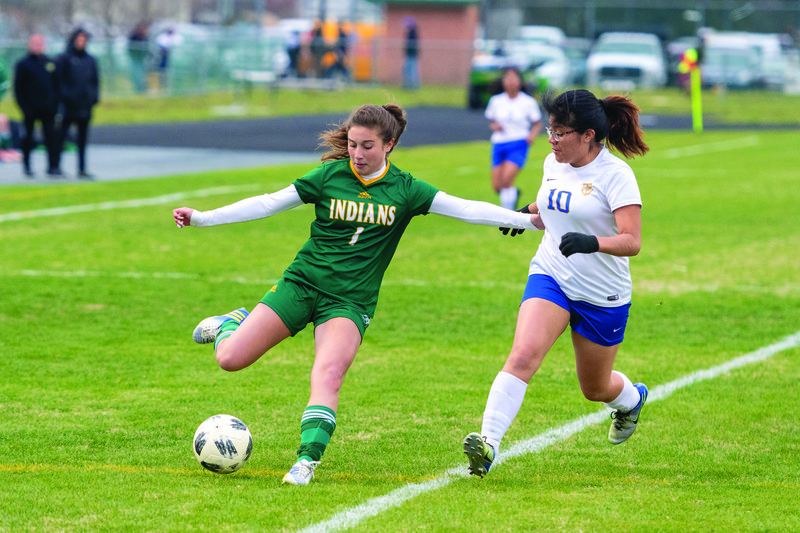 The loss was the first of the season for the Indians (4-1), but they had little time to dwell on it as they were set to host South Division rival Lake Forest on Thursday, April 11, after Coastal Point press time. Results of that game can be found on the Coastal Point sports Facebook and Twitter pages.